Those Christians, I tell you! They’re all so evil. All of them! If you don’t believe me, just switch on the television or go to the movies. Hollywood proves that Christians are evil, because Christians are often depicted as villains, and the media is always right. Seriously, though—why are Christians so often portrayed as horrible people in the media? Why are books, movies, TV shows, and video games full of perverted priests, prejudiced pastors, and sinister ministers? 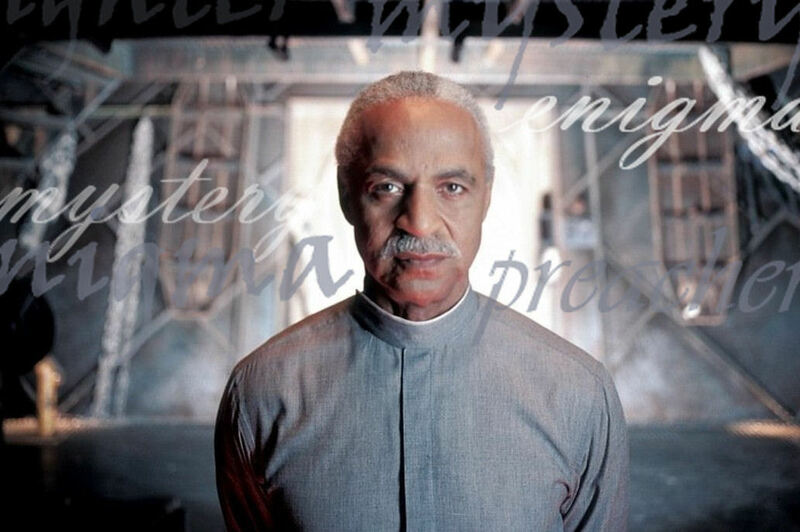 Consider Warden Norton from The Shawshank Redemption, a film based on a story by Stephen King. (I haven’t read any of his books, but I’ve heard Stephen King uses Bible-thumping Christians as a lot of his villains.) Warden Norton is an awful person. He mistreats prisoners in his care, denies them justice, accepts kickbacks, murders people, and generally makes himself unpleasant. All the while, he quotes the Bible and assumes God is on his side. 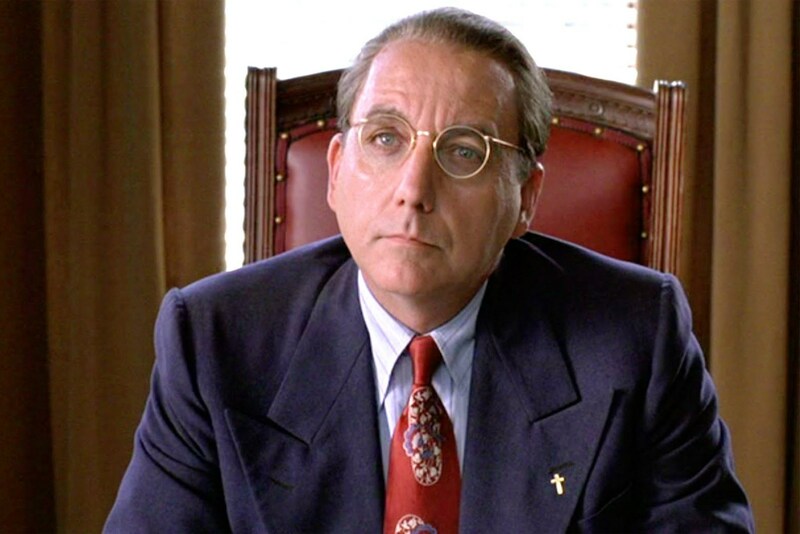 God loves you, but Warden Norton will probably shoot you in the face. Even when Christians in fiction aren’t evil, they’re often well-meaning but ignorant simpletons. Take Marvel’s Agents of S.H.I.E.L.D. I really enjoyed the series, but one episode irritated me. It was the episode featuring a Christian, and she was a bland, weepy, superstitious ditz. Why are Christians portrayed so badly in the media? There are actually quite a few reasons. It can be ironic or scary when a supposedly “good” person is evil. There’s an artistic irony when a righteous person is actually wicked. It’s also pretty freaking scary. Who isn’t disturbed when a good person turns out to be a bad one? Religious people have power and influence, which makes them great villains. Priest and pastors have influence over groups of people. What happens when religious leaders are evil? They command the loyalty of their followers—even when that loyalty is innocent or well-intentioned. Religious leaders have power and authority, which can be easily turned to wicked ends. Religious people sometimes do horrible things. I hate to say it, but there’s a little truth in the portrayal of priests as pedophiles and preachers as charlatans. Christians, and people who call themselves Christians, have done some awful things. The media reflects that. No secular media group wants to be accused of proselytizing. Media groups exist to make money. Unless they produce religious media, these companies don’t want to be accused of pandering to Christians or spreading religious propaganda. Creating a genuinely Christian character puts media groups at risk of seeming to push a religious agenda. It’s safer to fall back upon familiar stereotypes like the evil or ignorant Christian. Some religious traditions are spooky. Have you ever stepped into an old-fashioned cathedral? You should try it. Little noises are echoed and magnified. Candles light the vast, empty gloom. Stained glass windows depict sad, soulless saints. Somber Christs hang in perpetual agony on crosses and crucifixes. Some Christian customs and traditions are frankly a bit creepy. They really build an atmosphere for villainy. Some people just hate religion. I’m looking at you, Philip Pullman. As much as I understand these reasons for creating lousy Christian characters, I’m tired of the stereotypes. Am I the only one who thinks most depictions of Christians in the media are offensive? If other groups were so badly stereotyped, there would be outrage. Why is it socially acceptable to portray Christians as universally evil or ignorant? It’s a problem, and I have two suggestions for resolving it. First, do your research and create Christian characters that actually represent Christianity. I’ve already touched upon this, but I’ll say it anyway: religious stereotypes are not only offensive, but usually incorrect. Joss Whedon, God bless him, understands this. Whedon is an atheist, yet he created a character named Shepherd Book who is genuinely Christlike. Shepherd Book demonstrates a good understanding of Christian doctrines, and an equally good sense of humor. He is devout, patient, kind, and generous. To put it simply, Shepherd Book is represented by the media as a great character and a good Christian. It can be done. Learn from the good Shepherd. I’m not asking anyone in the media to create religious propaganda. I’m asking everyone in the media to create Christian characters that aren’t shameless hypocrites, greedy shysters, arrogant bigots, filthy perverts, sociopathic lunatics, or well-intentioned idiots. Is that really so much to ask? Second, it’s perfectly fine to create characters that are evil Christians—just don’t be lazy about it. I occasionally recommend an anime called Trigun. Set on an arid planet in the distant future, Trigun is basically the Old West in space. My favorite things about the show are its two main characters, Vash the Stampede and Nicholas D. Wolfwood, and their strained friendship. Vash is an expert marksman, unbridled optimist, and wandering hero. He lives by a philosophy of “love and peace,” refusing to kill anyone. “Ain’t it better if we all live?” he asks. Vash and his philosophy are tested by Wolfwood, an itinerant preacher who carries a literal cross wherever he goes. 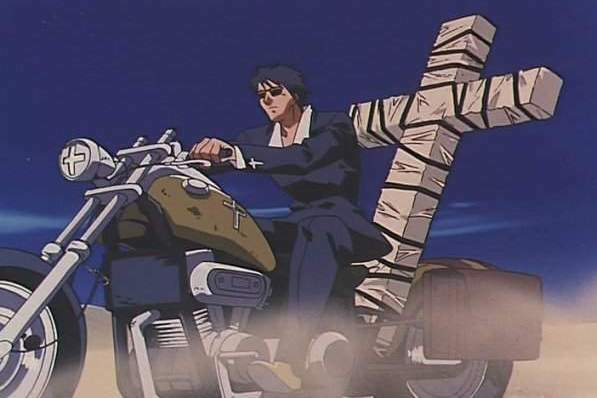 (When a bystander remarks that the cross is heavy, Wolfwood quips, “That, my friend, is because it’s so full of mercy.”) Despite his merciful profession, Wolfwood’s philosophy is a harsh one. There’s an Old Testament justice in his actions. He won’t hesitate to execute a bad man. The thing about Wolfwood is that he himself is a bad man. He drinks, smokes, sleeps around, and kills quite a number of people. (Wolfwood’s cross is actually a machine gun with compartments for handguns, which is either blasphemous or awesome.) Even his theology is flawed. However, in spite of his faults, Wolfwood is a complex character. He sees violence as a necessity, and regards the world’s evils (and his own) with determined resignation. To put it simply, Nicholas D. Wolfwood is a good bad Christian. He manages to be a Christian and a bad person without ever becoming an insulting stereotype. It doesn’t take offensive clichés to portray Christians as bad people. It can be done. Christians are generally depicted very badly in the media. That needs to change. Christians—even the bad ones—can be treated fairly, and they deserve to be. This entry was posted in Faith, Literature, TV & Movies, Writing and tagged anime, storytelling, Trigun by Adam Stück. Bookmark the permalink. I complain about this same exact thing when I see it come up in a show or movie. It’s so tiring. I’d add that homeschooling families are usually shown in a bad light. Either militant backwoods preppers who teach their kids to shoot guns and hate the government, or ignorant anti-vaccine types who won’t go to the doctor when their kids get sick. Both are such extremes they drive me crazy. And another thing that I hate is when there actually is a religious character who’s in the main cast, and they’re fine, decent people, but if someone starts to question how some of their beliefs make sense, they can’t stand up under the scrutiny. They usually end up just saying that faith means believing even when it doesn’t make sense, or that they just need to be able to believe in something to get through their day. Of course they can’t actually explain why bad things happen to children, or how evolution could even possibly be wrong, or whatever, because then, as you stated, the people who make the show would be jumped all over for spreading Christian propaganda. It makes so much more sense for them to offend the Christians than to offend ANY other religious group, including atheists. I’d say especially atheists, really. They seem to shout the loudest. And I agree, that’s such the cliche answer. “Faith means believing even if it makes no sense.” No it doesn’t! That’s blind following. You only have faith when it’s reasonable to do so. If, in this case, God proves why you should over and over throughout your life. If He doesn’t, well, there’s no reason to have faith. It’s like if a person was cruel to you time and again, you wouldn’t have faith they were going to suddenly treat you like a king or queen. And if someone loves you you’re whole life, the trust they’ve built makes you have faith even if something seems to put them in a bad light or something. Faith is built and it’s reasonable, it’s not blind. So many of these characters seem like cookie cutter, shallow puppets, just put in for the sake of doing it or something. No truth in it. I hadn’t thought about it, but you’re right — homeschooling is also very badly depicted in the media. (Heck, I was homeschooled for a few years, and it kinda rocked.) It makes me wish the media were not so quick to make negative assumptions. I certainly don’t mean to come off as antagonistic here, so my apologies if any of this seems that way. Unintentional! I just figured I’d add to the discussion, and these are my thoughts. 1. I think part of it stems from the fact that we’ve done horrible things as Christians throughout human history, as you said. I don’t think that totally covers it, though. Every DAY we fall short as followers of Christ. We preach and attempt to walk in his ways, and yet don’t, over and over again. Is it any wonder we’re seen as hypocrites and then portrayed in the media this way? We are! Perhaps with the best intentions, but the truth of the matter is our standard is unbelievably high. So when the “human” in us comes out (and it does, and will as long as we have this flesh), it’s much worse than if someone of no faith background were to act the same way. We set ourselves apart by believing what we do, and as a result our judgment is much more strict from all around us. It’s really not on them, it’s on us. Also a GREAT number of Christians, myself included until the past few years, ARE super shallow with a shaky faith built on empty tradition, quietly being selfish in private and pious in public. We believe at such a superficial level that anyone can knock us over. Our understanding of the Word is crazy limited. We know the passages we like, and ignore the ones that are hard. The problem is, the MAJORITY of them are hard, because the Bible doesn’t pull punches. It’s there for us to know, not to necessarily comfort us. When we know the truth, it IS comforting, but the journey to that truth is hard and often painful, so many of us just ignore seeking it in lieu of happy praise songs and empty communions. I don’t mean this in terms of “Look how terrible ye all are!” but as a factual observation that I spent 30 years blind to. I was this type of Christian, and I was adding to the reason for these kinds of characters. I didn’t seek out scripture and truth, only what I wanted to hear. And I told everyone to do better while I myself made no real effort to. If anything, these stereotypical villains are not harsh enough to compare to who I used to be. Or really, who I still am, in spite of my attempts to change every single day. I’m still not like Christ, which is the goal. I still succumb to the flesh. 2. Another really good reason, I think, for why these characters are made is it’s outrageously difficult to write a great Christian character from scratch. Think about it, for starters we don’t have very many examples in the real world. Even those that seem the “best of us” fall short, and to understand WHY we have to spend a great deal of time with them (and ourselves). It’s deep, deep stuff. Yes, some people are master storytellers and get it right, but I’ve personally attempted to write such characters and it’s DANG hard. At least to me! The line between witness and preacher is so tough to walk in fiction. Not to mention the fact that one person might see a character as just witnessing to their faith while another person is outraged at how preachy they are. It’s all so subjective! I don’t know if you’ve tried to insert a Christian character into a mainly secular story, Adam, but if not I’d say go for it. It certainly puts things in a new perspective when you find out how hard it is without it suddenly turning “religious” on you. Or at least, that’s how it was for me. I won’t assume everyone has that struggle. And it’s not that it’s overly difficult to write a generic faith character, either. When you add specifically Christianity into the mix, that’s when things get tricky, because of all the weight that comes with that word. The crusades, the judgment, the self-righteousness, the hypocrisy over the course of 2000 years. It’s like trying to carve an ice sculpture that’s already difficult to do, and then doing it blindfolded on top of it all while people throw rocks at you. I certainly don’t condone the actions of the lazy writers who take advantage of the word “Christian” to craft devious villains who are obvious hypocrites and evil, but at the same time I accept the blame on my own shoulders for such things. I do a bad job, and in spite of my efforts to do better every day, I keep doing a pretty bad job. There’s a line of a song I really like that says “I’ve been trouble since the day that I got here, trouble till the day I disappear, that’ll be the day I finally get it right.” The day I get it right, God willing, is the day I get to go home. (Or, if He wants me here longer, alright.) So to the masses, the only good Christians are dead Christians! 🙂 They’re the ones who have finally learned enough here to get to leave. Everybody else still has work to do, hence another day of breathing and failing and (hopefully) learning. Part of knowing all these things makes it so I’m not offended by any of these slanderous attempts. God is bigger than anything we can throw at him. I don’t need to be offended. I need to see why people think Christians are that way so I can stop adding fuel to that particular fire. I can’t change the people writing these characters, but I can change me, and as long as I’m here I’ll keep trying to. When enough of us do, the idea of un-Christ-like Christians will be ridiculous and NO ONE would put up with such a character. And they will disappear from media. What we need to work towards is the goal of all being so Christ-like that IF someone writes a Christian character who is evil, the general response is automatically “Well then obviously they weren’t really a Christian at all.” Right now, we aren’t at that place, and an evil Christian is sadly all too believable. I agree with much of what you’ve said here. The negative stereotypes in the media of Christians (and religious people in general) are due largely to the awful examples of many Christians in real life. However, I still think negative religious stereotypes are a dreadful problem for several reasons. First, while Christians are partly to blame for creating negative stereotypes, the media is also to blame to choosing to perpetuate them. It’s hardly fair only to blame all Christians for stereotypes that apply only to some, nor to blame Christians for depictions created by secular media. Second, even though there’s some truth in those negative stereotypes, they’re still atrocious. Just because, say, some white men are alcoholics doesn’t mean it would be acceptable for the media to portray most white men as alcoholics. Media should make some effort to respect their audiences, Christians included. Third, while there’s a little truth in negative stereotypes of Christians, those stereotypes are damaging to Christianity. Admittedly, it’s not the media’s responsibility to promote Christianity… but it’s not their responsibility to slander it, either. Negative religious stereotypes create an awful, mostly false picture of religion. Finally, as I pointed out above, religious stereotyping is not only offensive, but simply bad storytelling. Most Christians don’t fall into those stereotyped categories, and more fiction should reflect that. As for writing compelling Christian characters: I know it’s a challenge, but it can be done in secular fiction without being preachy. At the very least, it can be done without resorted to tired stereotypes! I don’t disagree with you that religious stereotypes are dreadful or cause problems. I guess where I think we may differ in opinion is our response to it. You seem to want the world to change what it’s doing, and I’m saying it’s up to us to do the changing. Who is going to harm you if you are eager to do good? But even if you should suffer for what is right, you are blessed. The world gets to do what it wants to, it’s their free will. We get to do what we want to as well, and if we’re followers of Christ’s example, we have a certain set of guidelines, rules, and goals that provide structure to what we do. They don’t. They make their own rules, and it’s unfair to blame them for what WE are called to do or be, or hold them to our set of guidelines. Let them do what they will, if we do what we’re supposed to it will make no difference how loudly they shout about us. Our actions will prove who (and whose) we are. The world isn’t bound by Christian standards, but I like to think that many of the people in it are bound by the standards of common courtesy! Up to a point, I don’t think it’s wrong to call for better depictions of Christians and other groups in the media. Neither I nor the media are bound by, say, Islamic standards, but I’d still be upset if the media depicted all Muslims as violent terrorists. Insulting stereotypes are, to some degree, everyone’s problem!